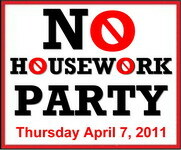 Posted on April 4, 2011, in Blog Hops, Domestically Challenged, Links, No Housework Party and tagged blog hop, domestically challenged, neat freaks, No Housework Day, non-domestic. Bookmark the permalink. 21 Comments. Looks really cool, something I can get behind. haha No we definitely would not want that ;)! I’m so excited! Can’t wait for Thursday! It looks like we’ll have at least a few participants. Yessss! I share procrastination with most of my friends! I knew there was something about you! Hope you’ll join us. Bring your coffee and leave coffee rings on our virtual end tables ;)! Girl, after everything that I have cleaned this week… a break is much needed! Thanks for the permission! WOOOHOOOO an excuse not to clean =) Following from Blog Frog SITS! 🙂 The more the merrier, Tonya! My hubby too! 🙂 Poor guys! This sounds like my kind of party, can’t wait to link up! Looks like fun. I don’t usually need much of an excuse to avoid housework, but it’s always good to have one. You cracked me up with your comments about the Neat Freaks. God love ’em. 🙂 You’ll fit right in Robin!